New York is a part of my soul. I was born in New York (Long Island specifically) and lived there until I was four years old. My parents were born and raised there. I went back in my early 20’s and lived there for a year. People often think of Manhattan when you tell people you’re from New York. I never did live in Manhattan (there’s no way I could ever afford it!) but I did go and do a lot of traveling in NYC both when I lived on Long Island and throughout my whole life. Most people know that NYC is extremely expensive, but there are ways to travel New York on a budget. The trip doesn’t have to be expensive and you can still have a great trip without breaking the bank. No doubt when you think of New York City, you think of the ubiquitous yellow cabs. They are featured in everything from movies and tv shows to art and music. Unfortunately they are one of the most expensive ways to travel in New York. I have been to NYC dozens of times and I have only taken a cab once. Stick to the other forms of public transportation. There’s a lot of stigma against the subway but really there’s very little reason to fear the subway. Read up on the routes before you go, get yourself an unlimited MetroCard (7 days of unlimited rides is $31 but if you’re going to be there more than a couple days its TOTALLY worth it) and go! Oh, and don’t bother renting a car if you’re going to be going in NYC. There’s no reason to and parking is ludicrous. Stick with public transportation and you’ll save tons. If you’re nervous about public transportation and you’re wondering how to plan, check out this guide to NYC transit. Look for free events and tours such as Free Tours by Foot rather than the expensive bus/boat tours. Here’s an entire list of free things to do in NYC. If museums are your thing, you can always skip the “big name” museums and head to some smaller ones instead. 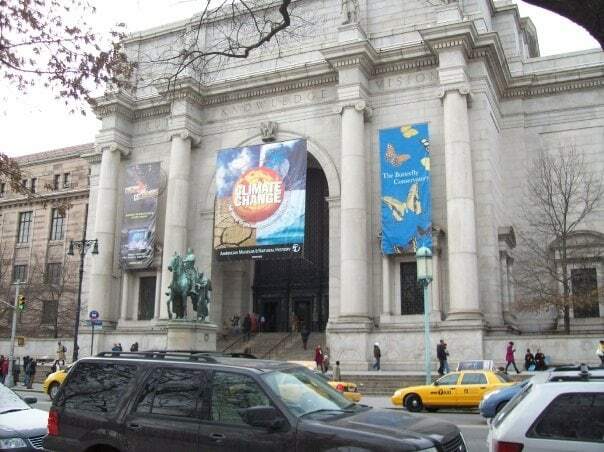 This is a list of free museums in NYC. There are so many overpriced things to do in New York. Sure, you can go to the top of the Empire State Building. But if you don’t, you can still have a quintessential New York experience. If you still really want to do the touristy things (museums, landmarks etc.) consider investing in a New York City Pass. The Staten Island Ferry is free and you can walk right on. You’ll get a great view of Manhattan from the water and it’s totally free! When my girlfriends came to visit me when I was living in New York, we decided to do the “touristy” things but quickly realized admission costs a fortune. Not to be deterred, we discovered the New York City Pass and we were able to get entrance to many city attractions at a huge discount. Basically you buy a ticket book which covers 6 of the biggest tourist attractions (The Empire State Building, Museum of Natural History, The Metropolitan Museum of Art and the choice of Top of the Rock/Guggenheim, Statue of Liberty and Ellis Island/Circle Line Sightseeing Cruises, 9/11 Memorial & Museum/Intrepid Sea, Air & Space Museum). The book costs $116 per person, but if you visit all the attractions its a savings of over $78. There’s also a “make your own” pass where you can choose 3 of the 10 available attractions for just $71. There are so many things to see in New York. Everything from street performers, to people watching to looking at all the massive skyscrapers…there’s just SO much to see you can’t possibly see everything in one trip. You could literally wander around all day long and not spend a dime (other than eating of course) and still be completely entertained. There are many shops you can pop into, lots of parks like Central Park and Battery Park. South Street Seaport has a lot to see as well and like the others is free to wander. There’s plenty of free things to do, and you may even stumble upon concerts, events or performances that are free also. The closer you get to Times Square, the more large chain establishments you will find. The closer to the tourist epicenter, the more expensive things will be. 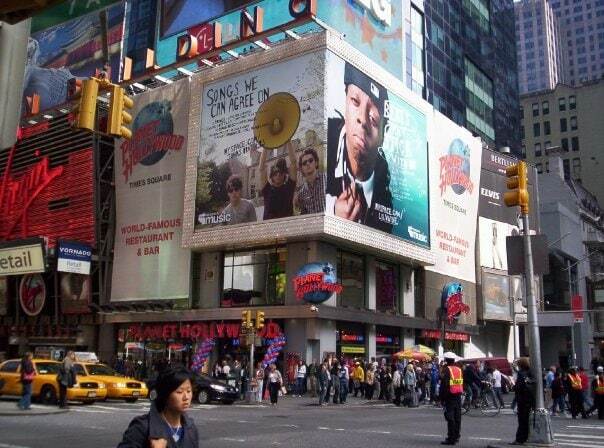 For example, on my first trip into the city we stopped at a TGI Friday’s in Times Square. After a lengthy wait for a table, we were starving and sat down to order. I pulled out my menu and scanned it quickly. After I spotted my favorite chicken fingers were going to cost me nearly $20 (not counting a drink) we got up and left. Do yourself a favor: try something new. Eat at a mom and pop shop, ask a local for recommendations or eat from one of the countless street vendors…but do it far FAR away from Times Square. Oh, and don’t forget to try some REAL New York pizza while you’re in town! Although it might seem glamorous, it comes at a very high price. Hotels in NYC are outrageously priced. Do a little research. If you can’t find a good deal, look further away for a place that is near the Long Island Rail Road, a bus route or subway route. You can stay on Long Island much cheaper and be in the city in under 30 minutes via train. You can also stay in the other boroughs like Brooklyn and get to New York easily. Unfortunately with any big city, there are people looking to prey on the naive tourists. You’ll see people selling items for massive markups, scalpers, and overpriced fake junk. Don’t fall for the scams. Once while visiting I was approached and offered a “great deal” on tickets to that night’s Broadway performance of The Producers. Thankfully, I knew that The Producers didn’t open for several more weeks so we politely declined and got the heck out of there. Pay attention to your surroundings and don’t get taken advantage of. Don’t bother with the I <3 NY mug in Times Square for $20. You can likely find one off the beaten path for far less. Whatever you think you might need while you’re in the city…bring it. Chance of rain? Make sure you grab that umbrella. Gonna be chilly? Bring a jacket! While the shops in NY have everything you could ever possibly need…chances are they are going to charge an arm and a leg for it. And then on top of the already sky-high prices is their ulcer-inducing sales tax. Just do yourself a favor and check the weather before you go. Back when I used to smoke (ugh…I know. Don’t worry, I quit almost 5 years ago now!) I didn’t plan ahead and ran out of cigarettes. I had to pay $11 for a pack, and that was like 10+ years ago. EVERYTHING is more expensive in NYC, so either bring it with or do without whenever possible. You have 3 airport options when flying into New York City: LaGuardia, JFK and Newark (New Jersey). Look around for the cheapest airfare because there’s reliable public transportation between all 3 airports. HOWEVER- when considering your decision, look into the cost of those ground transportation options. Newark is likely going to be cheaper than the other two, but getting to NYC takes longer and can be costly. We made the mistake of taking the first train option we saw and it was more expensive. We later found out there was a much MUCH cheaper option using NJ Transit instead of the option we took. Always look around to make sure you’re using the cheapest option instead of just going with whatever you find first. We learned a very expensive lesson that day! 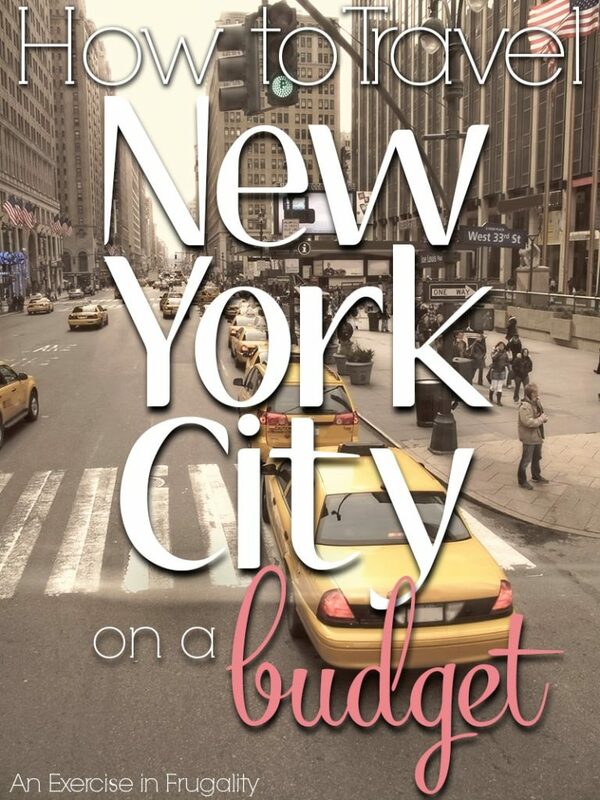 So those are my tips for having a great NYC adventure on a budget. There’s so much to see and do, you really don’t have to spend a lot, even though its one of the most expensive cities in America! You just have to get a little creative, and have a plan going in. Looking for more travel tips? Check out these other budget travel posts! Are you ready to travel NYC on a budget? I have always wanted to visit Nyc I never thought I could visit NYC because of how high the cost was to travel. Adding up the traveling expenses on top of the hotel and food just is not a mom budget plan I can take since I live in Michigan living on one income. I will one day visit NYC. It is on my bucket list of places to visit. NYC can be very expensive. These are good tips. I usually wind up walking in the beginning and then by the end of the day I take one cab. The city has great restaurants. Great tips. Especially number 10. Pick the wrong airport, and will pay way more and what you saved on the plane ticket. I love New York, too. Hey my hubby was born on Long Island and lived there until he was around four years old too! He later moved to Sidney NY – which is a lot like where we live now lol Kansas haha. People always think BIG CITY when they think NY but really there are places just like the midwest really. I love going to NYC though and you have some great pointers! City Passes are excellent to get anywhere one is available. Very helpful tips! I hadn’t heard of the New York City Pass before. Sounds like a good deal if you’re looking to do the touristy stuff! Whenever I visit a city, I’m thankful for good weather, which makes all the walking so much more pleasant. We’re going next weekend actually! I lost most of my city savviness, but I grew up in NJ and spent a lot of my youth in NYC. Then I lived in SF! I forgot most of the good tips out here in the country but you’re so right about the hotels, cabs, and chain restaurants. I love the city pass idea. I always get a week long subway pass too. Saves me money every time I go there and I love riding the subway and people watching. We loved our trip to NYC adn our City Pass was the best. I so want to go back. These are all good ideas. NY will probably never be a special trip just for a vacation for my family (we like small towns), but if we are ever there on business (good chance someday), these tips will definitely help! Good tips. I hate chain restaurants in general and never understood why people would want to eat there on vacation and not try some of the local cuisine. New York also has $1 pizza slice not too far from Times Square and it’s yummy! The NYC Pass is the BEST Way to go! My Husband and I visited a few years ago & only had like 3 Full Days I believe. We Walked EVERYWHERE & used the Subway too… I can’t wait to go back & bring my kids! We went to NYC on a budget last year and we used the New York Pass and for me it was definitely worth it. We were able to skip the ticket-buying queue for many of the top attractions, so it saved us time and money as well. We also enjoyed the free attractions that the pass do not cover. New York City may be known as the most expensive city in USA, but there’s also no shortage of free things to do. We visited some museums, Time Square and Statue of Liberty. We also went to a lot of diners and clubs and I watched free concerts at Central Park after checking out the NYC Parks website. By the way, I found a website listing free events in New York which is great because I didn’t have much of a budget. I think FreeEventFinder.com might be useful to people also visiting New York city who are looking for free events in New York. And for you Broadway lovers that don’t want to spend an arm and a leg on tickets, make sure to check out the lottery system, the rush tickets, and the cancellation line options. If there’s a show you want to see, these are all great viable options. Totally agree with you: the Staten Island Ferry is a great free “attraction.” It’s such a nice view of the Statue of Liberty and the city! I didn’t know that NYC can be done on a budget. Was brought here by Pinterest! Actually, $31 for a one-week pass is not too expensive! I remember paying 24 euros for a 3-day ticket when I was in Amsterdam!